You may have heard that Google is joining the race for the semantic search engine. Semantic search is the capability for a computer to understand what you're searching for based on the meaning behind your words instead of just pulling out keyword-based results. Google is up against a wide range of competitors for the semantic crown including newcomers Kumo, Microsoft's upcoming redesign of Live Search, and Wolfram Alpha-a search engine making some outlandish and unverifiable claims. Now when you search on Google, the company claims, its search engine will be able to understand and associate your queries with related keywords. It will then display more relevant related search terms at the bottom of the page. For example, Google says that if you search for "principles of physics," their search engine will "understand that ‘angular momentum,' ‘special relativity,' ‘big bang' and ‘quantum mechanic' are related terms that could help you find what you need." These subjects are then displayed as related searches at the bottom of the page. Now I don't know about you, but I am more likely to search for historical events, famous people, or a news story rather than the inner workings of physics. So I thought a test using more common subjects would be a better measure of the new Google. 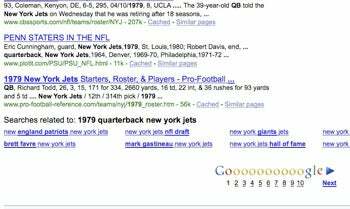 For my search I wanted to know who the quarterback was for the 1979 New York Jets. Not exactly brain surgery, but it is still a niche subject with related searches that might be of interest. To begin my search I typed in, "1979 quarterback new york jets." I quickly discovered that Richard Todd was the starting quarterback for the Jets during the 1979 season. But there really wasn't a noticeable difference with Google's related searches. At the bottom of the page I got results for "New England Patriots and the Jets," "Brett Favre," "Joe Namath," "New York Jets Super Bowl" and "Mark Gastineau." While all of these subjects relate to the Jets as a team, only a few of them have anything to do with the 1979 quarterback or the team that season. I also think it's notable that Google didn't have Richard Todd as a related search term at the bottom of the page. Perhaps this little bit of information is a little too specialized to be a fair test, so I did some other searches using other terms. I won't go into these results because the result was the same: I found what I wanted but I wasn't noticeably impressed compared to my Google experience last week or even last year. Does this mean anything for Google? Google is still the same old Google and an excellent first stop for finding information. However, Google is flying the semantic search flag without really delivering a noticeably different experience. If semantic is the future of search, then Google has a long way to go.